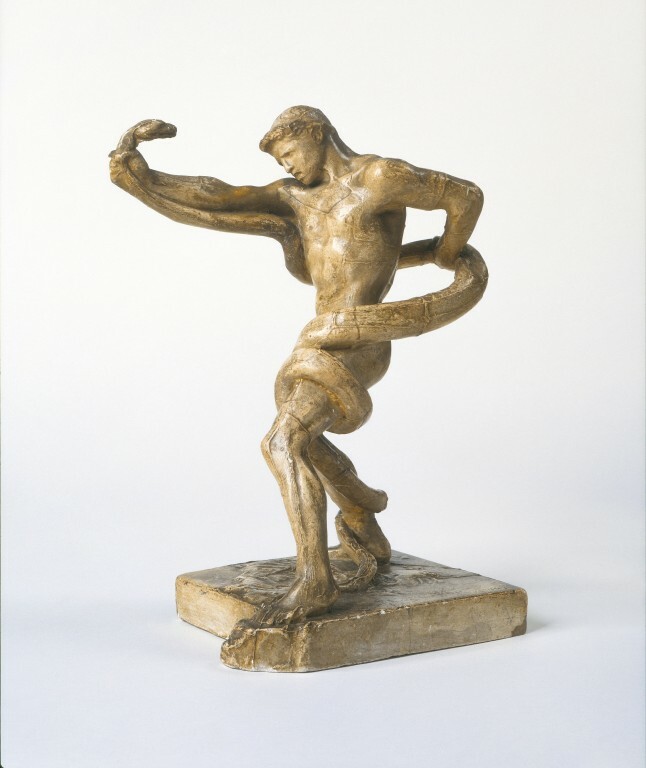 This is the reduced preliminary cast for Leighton's full-size bronze called Athlete Struggling with a Python in Tate Britain, London. The original clay model from which this plaster was cast was handed by Leighton to another leading painter and sculptor, G. F. Watts, who arranged for it to be cast. The model has since disappeared. The full-size bronze, signed and dated 1877, was exhibited at the Royal Academy of Arts in London in that year. A replica of it was carved in marble in 1890 by F. W. Pomeroy for the Glyptothek museum in Copenhagen, Denmark. The Royal Academy has the original plaster model for the full-size bronze at Leighton House, London, given by Leighton in 1886. Three further versions in bronze and one in waxed plaster are also in the Royal Academy collection. A plaster sketch given by Alphonse Legros in 1897 is in Tate Britain. A further version in bronze is in the Ashmolean Museum, Oxford. Frederic Leighton (1830-96) was born in Scarborough in 1830, the son of a physician. After receiving an all round education, he studied art at Frankfurt under Steinle, and at Brussels, Paris and Rome. In 1852 he began to work independently and spent the next three years in Rome. Leighton's painting Cimabue's Madonna carried through Florence (1853-55) was his first major work, and an immediate success. When it was shown at the Royal Academy in 1855, it was bought by Queen Victoria. Leighton settled in London in 1859, though he frequently travelled abroad; he was elected ARA in 1864 and RA in 1868, and attained the Presidency of the Royal Academy in 1878. He was the most influential of the Victorian Classical painters, and an important exponent of the 'subjectless' painting associated with the Aesthetic Movement, in which pictorial narrative is suppressed in favour of beauty and atmosphere. Leighton died on 25 January 1896 and is buried in St. Paul's Cathedral. 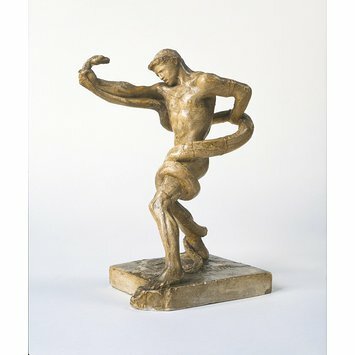 A naked athlete, crowned with a wreath, struggles with a python. Standing with legs planted wide apart he holds the python at arm's length with his right hand. With his left, which reaches out behind him, he grasps the python's body. Given by the sculptor to G.F. Watts. Purchased by H.D. Molesworth, on behalf of Dr. W.L. Hildburgh F.S.A. from Cavendish Hood and Company Ltd. for £1, 2, Baker Street, W1. Given by Dr. W. L. Hildburgh, F. S. A. in 1954. Historical significance: Another cast is in Leighton House, the gift of G. F. Watts.